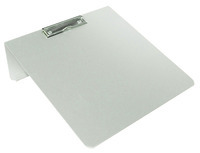 This Stackable Writing Board is made from sturdy aluminum, and it's stackable! Surface is 12" x 12" (30.5 x 30.5cm). Search Writing Boards for more options. Sold as Single Unit Large 12" x 12" surface area with low-profile grip-clip 20 degree angle for optimal positioning Space-saving stackable design Lightweight - only 24 oz!